Nanjing's food and beverage industry has both maintained its unique local food tradition Huaiyang cuisine and the Qinhuai flavor snacks and also made a rapid development of diversity foods. The Sichuan cuisine, Cantonese cuisine, Shandong cuisine, Shanghai cuisine and special dishes of other provinces and cities have settled in Nanjing, the foreign foods have also entered the Nanjing restaurant market one after another. There are upscale restaurants and hotels as well as various small restaurants with different cuisine styles being scattered throughout the whole city. Nanjing cuisine is a branch of the Huai-yang cooking school, which is historically called Jing-Su cuisine and is notable for the emphasis placed on original flavor and carefully selected raw ingredients. Nanjing dishes are traditionally bright in color and use only a moderate amount of seasoning but a significant amount of oil. The cooks are especially good at the cooking methods of simmering, stewing and fork roasting. Many dishes look hard in appearance but soft in essence. The broth is thick with pure fragrance; the meat looks fat but not greasy, dishes are not salty but very tasty, soft and boneless yet keeping the original shape; smooth, tender, crispy, having integrated all the best of the different cooking schools and the tastes fit for all the guests from different places. 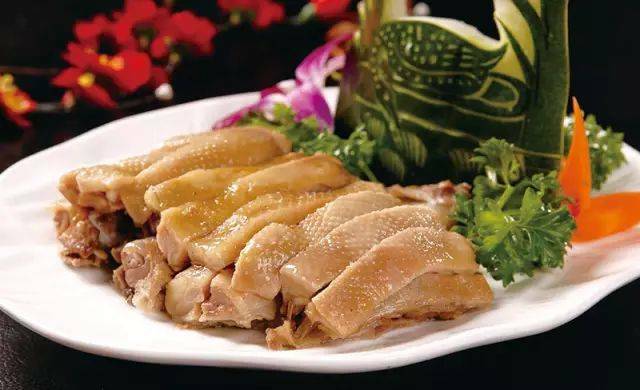 Delicious and tender salted duck is a Nanjing specialty, rich in flavor but not too greasy. Salted duck hangs from many city shop windows and the best time to purchase and eat the duck is said to be August when the duck is seasoned with Osmathus flowers and has a delicate flavor. Plum Garden, 2/F, Jinling Hotel, No. 2 Hanzhong Road; +86 25 8472 2888; close to Xinjiekou (P26). Metro Line1/2 XinjiekouStation Exit 6. Turn right at Hanzhong Road, walk straight on and turn right at the first crossing, then walk straight to Jinling Hotel. The Duck Blood Soup is one of the most popular food in Nanjing. The name of this dish may sound odd to foreigners who might wonder how the blood and soup is combined. Duck blood noodle soup. It is not as perturbing as it sounds. The cubes of duck blood have a silky bean curd-like consistency and taste similar to Chinese black mushrooms instead of the heavy iron one would expect from blood. The broth is boiled with duck bones, innards and many Chinese herbal ingredients. The 300,000 square-meter Gucheng Lake in Nanjing’s southern suburbs breeds some of the tastiest hairy crabs in the nation. Every autumn between mid-September and mid-October, Gucheng County throws a grand festival to celebrate the harvest season of the lake delicacies. The local way to enjoy these crustaceans is to steam them, crack the shells open, then dip the meat in vinegar. You can try it on Gaochun Old Street (高淳老街); go to Gaochun from Nanjing downtown, take a bus from Nanjing South Long-Distance Bus Station (next to Nanjing South Railway Station); journey takes about 90 minutes. These steamed dumplings are sublime. Under an extremely thin layer of dough hides a bomb of delectable broth and a ball of tender pork. To eat these jiggly meat pockets, bite a small "window" on the skin, drink up the broth, dip the rest in vinegar, then munch. Metro Line1/2 Xinjiekou Station Exit 6. Turn right at Hanzhong Road, walk straight on and turn right at the first crossing, then walk straight to Jinling Hotel. These doughy purses, loaded with minced beef mixing diced ginger and spring onion, are fried until golden and crispy. The fragrant crescents provide a contrasting taste sensation: the outside is crunchy while the inside is moist and soft. Doufunao, a fresh and soft preparation often served for breakfast but with the addition of a topping slightly spicy and oily. A small bowl of this is still good for breakfast and even better toward the end of the meal. The crumbly pastry comes in two types. The oval one is savoury, with minced pork and spring onion; the round ones are sweet with melt-in-your-mouth sugar. For both flavours, the local secret is to enclose a lump of duck fat in the dough before baking. The white sesame topping brings in an aromatically sweet kick. The small Meihua Zhenggao is a local cake delicacy. This dense and dry cake is slightly sweet with bits of dried fruit. More like a scone or shortbread to Western tea aficionados it is perfect with a steaming cup. Familiar to many is Shao Mai, a palm sized amount of meat or other ingredients wrapped up in a sheet of dough gathered up around the sides. Nanjing cuisine is far less heavy than others in China and relies on a combination of oils and aromas that these snacks employ giving great results. How to get there: Metro Line 1 Xuanwumen Station Exit 1.